Study of protein-protein interactions in plant cells. Visualisation using fluorescence techniques. Department of Cellular and Molecular Biology, Adam Mickiewicz University, Poznan, Poland. Department of Gene Expression, Adam Mickiewicz University, Poznan, Poland. During my Ph.D. in Poznan, I was focusing on the analysis of protein-protein interactions using fluorescent techniques. 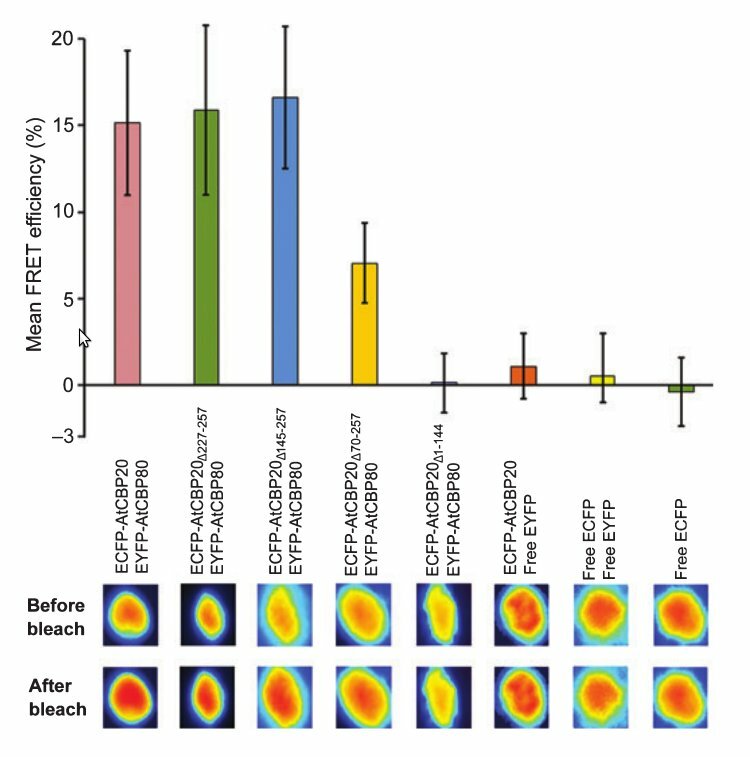 I mainly used two microscopy-based methods: Bimolecular fluorescence complementation (BiFC) and Fluorescence Resonance Energy Transfer with Acceptor Photobleaching (FRET ABP). My main focus was to investigate the interactions within and with cap-binding protein complex (CBC). This protein complex binds to the caps of all RNA polymerase II transcripts and plays an important role in RNA metabolism. We first showed that transport of AtCBC from the cytoplasm to the nucleus in the plant cell is different from that described in other eukaryotic cells. Smaller subunit of the complex, AtCBP20, plays a crucial role in the nuclear import of AtCBC. The C-terminal part of AtCBP20 contains two functionally independent nuclear localization signals (NLSs). At least one of these two NLSs is required for the import of CBC into the plant nucleus. Complementary approaches using yeast two-hybrid, FRET and BiFC enable us to convincingly show the N-terminal part of AtCBP20 is essential for interaction with AtCBP80. The cap is also present in pri-miRNA transcripts. miRNA processing in plants requires SERRATED (SE), DICER-LIKE 1 (DCL1), and HYPONASTIC LEAVES 1 (HYL1). It is known that pre-mRNA and pri-miRNA transcripts share common processing components. Recently, the roles of the CBP20, CBP80, and SERRATED in both mRNA splicing and miRNA processing has been shown. By using BiFC I also investigated the interactions between CBC and SE or HYL1. We showed that CBP80 interacts with SE. It may be that SERRATED functions as a physical link between CBC and distinct RNA processing machinery for pre-mRNA splicing and pri-miRNA processing. The Plant Journal 59, 814-825 (2009) Reprint. Szweykowska-Kulinska Z., Brown J.W.S., and Jarmolowski A.
Nucleic Acids Research 42, 1224-1244 (2014) Reprint.